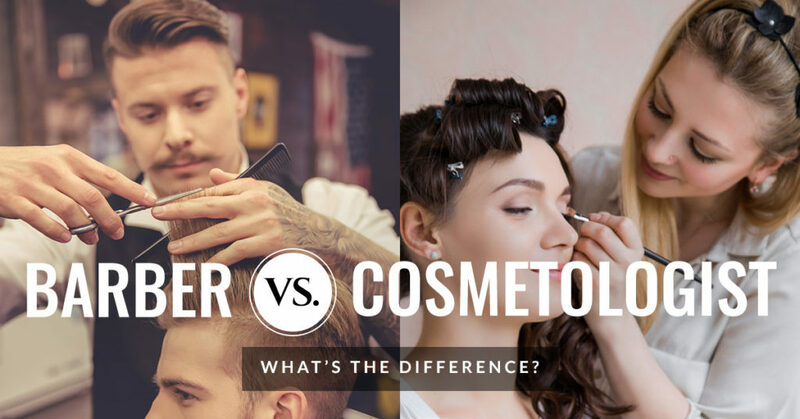 Barber vs Cosmetologist: What's the Difference? Cosmetology and barber are used frequently as they are often the most common specialties of women and men attending or planning on attending beauty school, respectively. In a broad sense, a barber and a cosmetologist have the same job of cutting and styling hair. There is, however, a specific, significant difference between the two which make them completely different fields. Barbers specialize in specifically cutting and styling men’s hair. In beauty school, would-be barbers are taught and trained in men’s hair fashion and hair growth and characteristics. Barbering students also get experience using tools such as razors and shaving knives that are unique to men’s hair styling and beard design. Barbers are also taught in facial hair care, styling and grooming techniques. Women's cutting techniques are also taught in Taylor Andrews barbering program. A significant difference between barbers and cosmetologists is that cosmetologists can perform other services in addition to cutting, washing and styling hair. A cosmetologist can apply chemical services like hair color, perms, or chemical straighteners and can perform pedicures, manicures, waxing treatments, facials, apply makeup, do nails, put in hair extensions and do Eye lash extensions. Both barbers and cosmetologists undergo the same schooling and both must pass licensing exams in order to practice and offer their services. In Utah Barber takes 1000 hours of education to graduate where as cosmetologist require 1600 hours of education. Both hair cutting and styling fields offer many career opportunities. Barbering and cosmetology are ideal professions for those who are creative, entrepreneurial and have a desire to make others look their best with a great haircut. Both are rewarding professions that require hard work and dedication. Regardless of which one interests you, it is important to research the industry and talk with a recruiting director in the profession in order to get a feel of it and determine whether it’s the one for you. Whether you want to go into barbering or cosmetology, Taylor Andrews has an award-winning, highly esteemed program for you. Why keep putting off your dream of being in the beauty industry? Contact us today to speak to an admissions specialist to learn more about both programs and how Taylor Andrews can help get your dream barbering or cosmetology career off the ground.